With all the things we plug into our computers, walls and other outlets, you're bound to get a few cables flailing about your desk and tangling themselves up. These cheap, sturdy cable shorteners will keep your cables organised in style.We've mentioned how to make a cable wrapper out of an old gift card, and that's great for headphone cables. But, when you're trying to wrap cables a bit larger, like a USB or AC cable, you probably need something more sturdy. We love the look of these Applecore cable wrappers, which shorten up your cables and keep them from getting in your way or tangling with others. They come in multiple sizes and colours, which is also nice, and best of all, they're just a few bucks a pop — well worth it for the increased sturdiness you get over some DIY options. Just be careful not to wind them too tight and fray the joints at the ends. Power cable + coiled = inductor = heat (fire risk). Data cable + coiled = antenna = additional rfi noise. While your unlikely to end up with corrupted data from using your cables like this, long term use of power cables coiled up like this is not really worth the possible fire risk. obviously it depends on what voltages are going through the cable. Most of the cables you would be wrapping would have only 5-12 volts which would produce fairly minimal heat alot or car chargers have coiled cables and they don't seem to start fires.. Also im no expert but most of the data cables aren't use RF frequency to transfer data are they? I'm not sure does anyone know. > Power cable + coiled = inductor = heat (fire risk). Very true for mains voltages. Otherwise, safe. > Data cable + coiled = antenna = additional rfi noise. Just as much of an inductor so it actually reduces noise. The inductance can negatively effect high speed data though, but realistically, we are talking USB3 or gigabit ethernet over LONG cable lengths. The wider options might be okay for data cables, but the smaller ones could seriously be risking damage to your cable - as the cables get thicker, you should coil them more loosely. You really don't want to try this kind of thing with ethernet or optical cables. 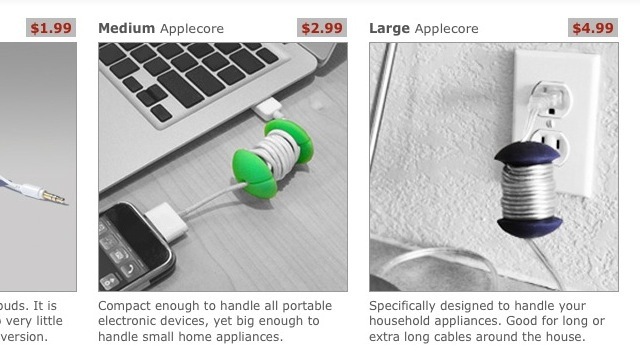 I have couple of these used for my cell phone charger and my USB mouse. They work great! My laptop charger and WD external hard drive also has it. My desk looks so much cleaner. Their website has couple nice photos for desk lamps as well. Check it out. Just hammer a nail straight through the middle and depending on the amount of power you push through the cables, you'll be able to create a magnet strong enough to blow a screen :) probably not that strong. Maybe strong enough to hold your keys. Hi there, I have tried this thing, but I really don't think it is handy. It is always in my way, and not practival for storage. I found another cable organizer, which is called Bobino Cable Buddy. That's much better. First of all it comes in various sizes for different cables, secondly it is flat and much easier for storing things. I really do prefer bobino. Check out the website http://eu.mybobino.com/home and look at it!